Camp 18 Logging Museum & Loggers' Memorial! 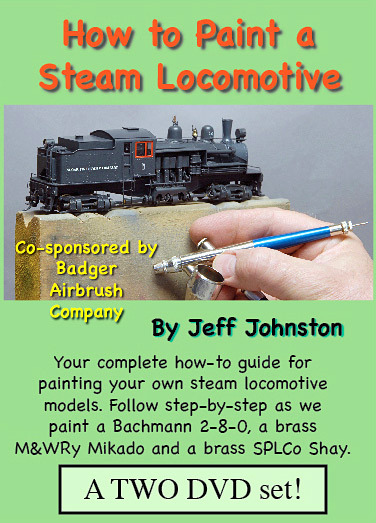 Have you ever wanted to learn to paint your own model steam locomotives? Now you can, and it’s easy to learn how! 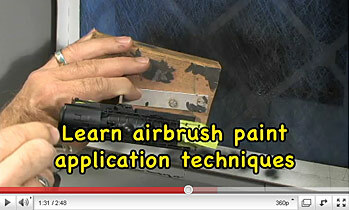 This new video presentation – “How to Paint a Steam Locomotive” – shows you, step by step using easy to understand methods, exactly how to paint and finish a steam locomotive. And we don’t just show you once! The TWO DVD set starts with a chapter on tools and techniques to get you headed in the right direction. Next you get three detailed chapters covering three separate painting projects: One, a basic-level Bachmann 2-8-0; Two, how to paint a brass Shay, a two-truck PFM 70-tonner detailed and finished as Sugar Pine Lumber Company #10; and Three, a brass Mikado, a Westside Models of the Minarets & Western Railway #104, an MK-10 class. Every step is covered – disassembly, cleaning, masking, paint blends and mixing, airbrush use, prep for paint, painting, touch up, decals, final clear finish – the whole works. Nothing is left to chance. This project uses Badger ModelFlex paint, but other brands will work as well. Watch a trailer of this painting DVD on YouTube! Due to the depth of details and information presented, this two-DVD set covers the painting only. A separately-available companion DVD (see below) details the weathering steps for the two rod engines. 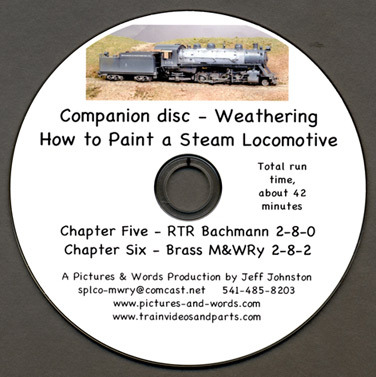 If you buy the companion DVD along with “How to Paint a Steam Locomotive,” it’s an additional $5.00, and postage is free! Total run time: Two DVD set, About 160 minutes. Add the Weathering DVD, three DVDs total, for an extra $5.00, or $27.00 plus $5.00 shipping. Painting a locomotive is just half of the story. Some modelers prefer the brand-new, clean look for their motive power, but those who want things to look a bit aged and used may find the “Weathering” DVD, a companion to the “How to Paint a Steam Locomotive” DVD, very useful. In this DVD, we show you all the steps we took to complete the weathering on the Bachmann 2-8-0 and the M&WRy #104 Mikado. Paint washes, weathering powder and airbrushing are all covered in detail as we add a touch of age and road-weary miles to these engines. Total run time: About 42 minutes. *International shipping is an additional $5.00 per DVD. *US shipping is an extra $3 per DVD. Inquire about quantities in excess of 4 DVDs. High QualiltyFull-Scale & Model Railroad DVDs, Videos, Links & Parts!